To the disappointment of Internet memeists everywhere, Leonardo DiCaprio does NOT get raped by a bear in the most talked-about scene in director Alejandro G. Iñárritu’s follow-up to last year’s runaway Oscar success Birdman. But given the sheer brutality of the scene itself, a collective masterclass of tension, build-up and fantastic CGI (that bear just about passes for the real thing), he might as well have been. It is just one of many instances during The Revenant where the actor allows himself to take a severe beating by nature itself for over two hours, but unlike The Passion of the Christ (another film about a man being tortured and beaten to death for the same amount of time) it never becomes truly gratuitous or even dull to watch – plus, there’s way less anti-Semitism, which certainly helps. 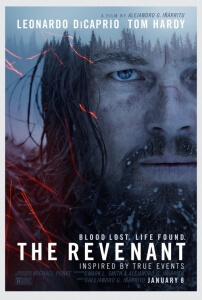 A stunning piece of cinema, one that you can tell the cast and crew went above and beyond to deliver as smoothly as possible (on-set problems be damned), this is also perhaps the most intense episode of Bear Grylls’ Man vs Wild ever filmed – it sees DiCaprio’s Hugh Glass, a tracker on a fur-trapping expedition, be left all but dead after said bear attack by his party, including ruthless criminal John Fitzgerald (Tom Hardy), and quite literally drag himself out of the wilderness while at the same time try to survive the harsh winter landscapes as well as a vengeful tribe of Native Americans looking for their Chief’s kidnapped daughter, all the while seeking revenge on Fitzgerald for what he did, other than leave him behind. Essentially a survival flick, it nevertheless captures your attention through Iñárritu’s uncompromising approach that soaks in the brutal force of nature – certain scenes go by in Birdman-style single takes, whether it’s a quiet opening scene set on a river or an unnerving chase on horseback that ends with the horse going over Cliffside – and through DiCaprio’s rather wondrous physical performance. The actor, so pitied by his fan-base for never quite reaching Oscar gold (until now, most likely), is fully committed to the part, with many scenes going by without him uttering a single word either by circumstance or by necessity, and his ability to not only adapt to the abhorrent weather conditions but also to the wonderful make-up artistry that creates his wounds (look out for one painful instance where water seeps through a hole left in his neck) makes this a remarkably vanity-free performance that adds up to perhaps some of the strongest acting of his career. Same for Hardy, who is equally impressive as the increasingly-loathsome Fitzgerald, but seems to be a villain acting on logic rather than instinct – his early desire to kill the catatonic Glass, who had previously endangered other men by slowing them down in his make-shift carrier, is a rational one which could also save the lives of others; it just so happens to be what he does later on that makes him a baddie worth rooting against. Special mention must also go to Will Poulter as Fitzgerald’s moral-struck accomplice; he is a fine young actor who gets his due here with a good character and an equally-strong performance to go along with it, he should not be ignored amidst the giant contenders that are DiCaprio and Hardy. As you’re watching such forceful brutality, the desire is always there to see Glass return and exact revenge, not just because of DiCaprio’s performance but also due to just how Iñárritu crafts every single scene along with cinematographer Emmanuel Lubezki, who both make the wilderness look like one giant obstacle course that must be conquered to get out clean on the other side. Whether it’s floating down river rapids to hollowing out a dead horse in order to sleep amongst a snowy backdrop, every single piece of nature in this film looks and feels completely damaging to the body and soul, which makes it a sheer wonder how Glass manages to not only survive most of it but also comes out feeling more alive than ever. With this and last year’s Birdman, Iñárritu has slowly become one of Hollywood’s most admired directors for his absolute devotion to the craft of filmmaking, and while his particular style won’t sit right with everyone his adoration for even just the smallest details in his films whether it’s the lighting or the set design is one that should be universally recognised. It’s not even afraid to get a little artsy every now and then, with several flashbacks and dream sequences with Glass’s dead wife and his son Hawk (Forrest Goodluck) looking like they fell right out a National Geographic documentary directed by Terrence Malick, but although it just about borders on being a little bit too pretentious it’s never – like a lot of arthouse films in Malick’s style do – boring or even alienating. The artistry also seeps right into the impressive epic score by the collective team of Ryuichi Sakamoto, Alva Noto and Bryce Dessner, which gives the film the feeling of a true classical nature. As much as we liked it, we’ll fully admit it is not for everyone; anybody with a weak stomach might not make it through the multiple scenes of violence and brutality, and those allergic to Iñárritu’s style after the Birdman backlash will certainly not appreciate it, but take it for what it is: The Revenant is a sheer force of nature, if you’ll excuse the pun. The Revenant is a beautifully uncompromising tale of survival and brutality, expertly directed by someone who clearly harbours a true passion for filmmaking, wonderfully acted by a vanity-free Leonardo DiCaprio and Tom Hardy, and filled with enough cinematic beauty to make it last on several film scholars for years to come.